A simple visualization of influential physicists developed to aid students with a paper to write and nowhere to start. I stumbled across the above illustration and it fascinated me. I was inspired to make a map of physics as it had developed, but it proved too difficult for a novice who had never taken a single class in basic physics. Hence began a long search for something I could map. A few forays into Wikipedia, some choice university websites, and I made rough divisions for the branches of physics. Each physicist was painstakingly documented with their notable contributions, country of origin, birth date - death date, and if they had won a noble peace prize, that as well. From there I sorted each physicist into branches of physics as I understood it: classical mechanics, electromagnetism, thermodynamics & statistical mechanics, quantum mechanics, and relativity. The audience was not well-defined for this iteration. Who could use this, and how? What purpose or function did this visualization serve? It looks like classical physicists are good and modern physicists are evil; the use of color needed to be revisited. The blue bars were not fulfilling their purpose; that is, to distinguish between branches of physics and to show the parallel development of physics. Rather, they made it more difficult to see who lived at what time period-- something that should be easy to distinguish. The entire poster was crowded and difficult to navigate. I realized I needed to take a step back. There was no need to overcomplicate the data visualization. I went back to the post-its and studied them, eventually deciding that they were the clearest and best way to visualize the information I had gathered. 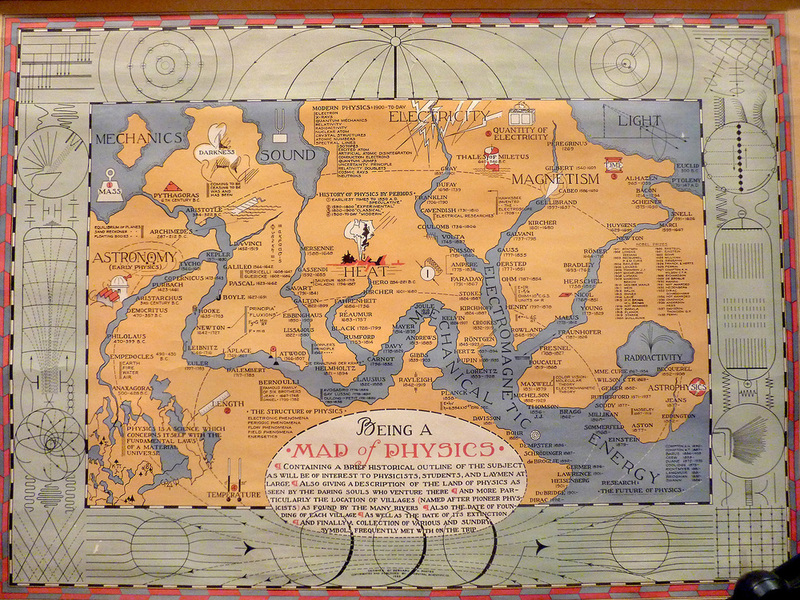 For the audience I had in mind, a reference sheet was the best way to portray the map of influential physicists.